Living in Scotland has allowed author A K Michaels' imagination to run as long and wide as the awe-inspiring landscapes in Scotland. Her paranormal romance and urban fantasy novels are packed with a bite! If you're a fan of shifter novels, follow A K Michaels today on her BookGorilla Author Page. Please enter your email address and click the Follow button to follow A K Michaels! Sabrina's Vampire Series, Books 1 - 3: Boxset of this hot paranormal series! Supernatural Enforcement Bureau, Book 3, Bureau Under Siege: Paranormal Romance With A Bite! The Witch, The Wolf and The Vampire Series Boxset: Grab all three books in this thrilling series! 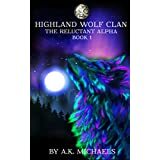 Highland Wolf Clan, Book 4, Despair and Destiny: Continue this thrilling Shifter series with Book 4. Guild of Dragon Warriors, Terigan's Trials: Dragon Shifter Paranormal Romance! Highland Wolf Clan, Book 3, New Beginnings: Third exciting book in this hot Highland Shifter series!